After World War I, the victorious allies had carved up German territory and given part of Germany (Western Prussia) to the newly re-established nation of Poland. Eastern Prussia was left isolated; totally cut off from Germany. Tensions among Poles, Jews and minority Germans simmered in the area. 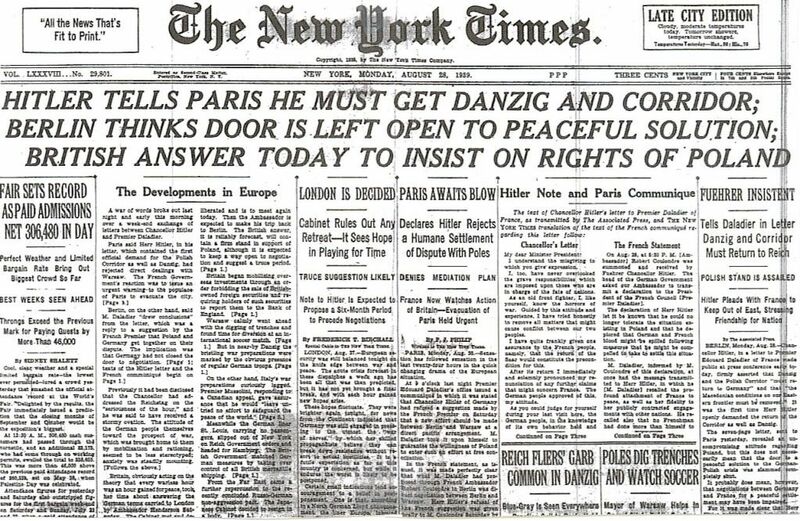 "BERLIN THINKS DOOR IS LEFT OPEN TO PEACEFUL SOLUTION"
Even the pre-war August 28th headline of the Hitler-hating New York Times confirmed that Hitler sought to avoid war with Britain & France. 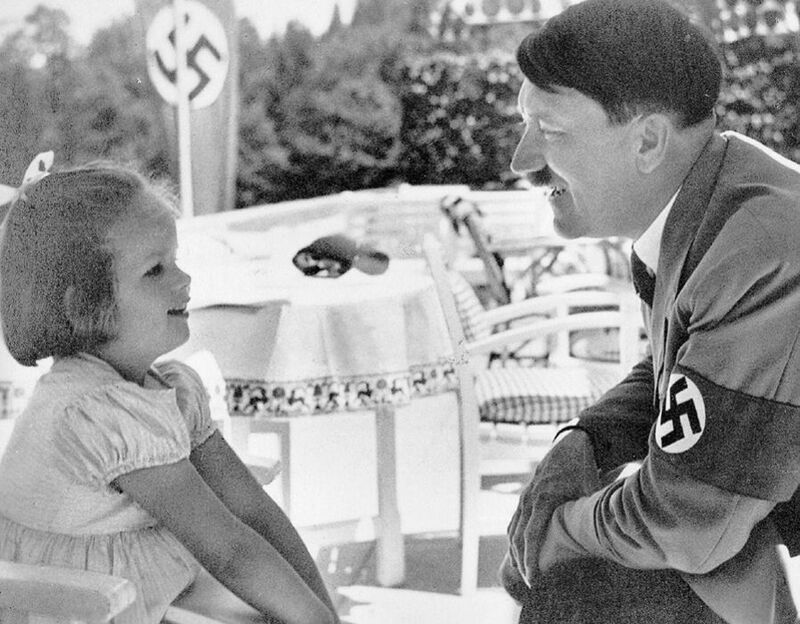 Hitler's thoughtful letter to France is published in full. 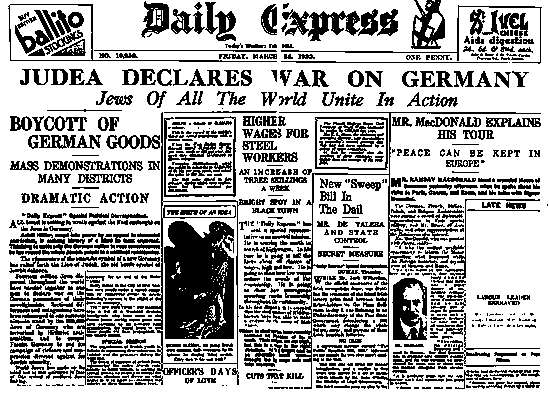 Six years before the war was to even start, International Jewry had already declared war against Germany. The "Polish Corridor" was to serve as the match which lit the flame. "On the nights of August 25 to August 31 inclusive, there occurred, besides innumerable attacks on civilians of German blood, 44 perfectly authenticated acts of armed violence against German official persons and property. These incidents took place either on the border or inside German territory. On the night of August 31, a band of Polish desperadoes actually occupied the German Broadcasting Station at Gleiwitz. 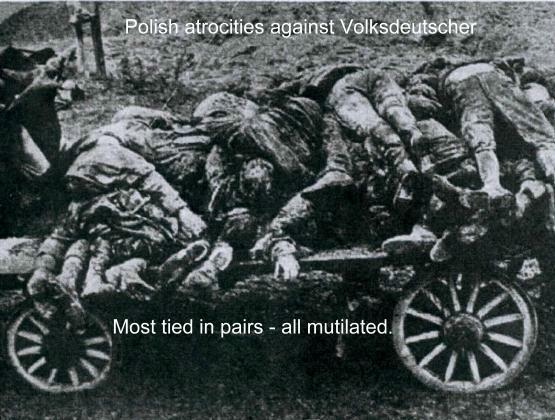 Now it was clear that unless German troops marched at once, not a man, woman or child of German blood within the Polish territory could reasonably expect to avoid persecution and slaughter." 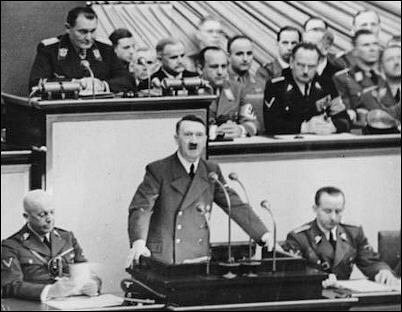 In speech before Reichstag, Hitler pleads with Britain & France to rescind recent war declarations . "I have always expressed to France my desire to bury forever our ancient enmity and bring together these two nations, both of which have such glorious pasts. ....I have devoted no less effort to the achievement of Anglo-German understanding, no, more than that, of an Anglo-German friendship. At no time and in no place have I ever acted contrary to British interests..."Why should this war in the West be fought?" 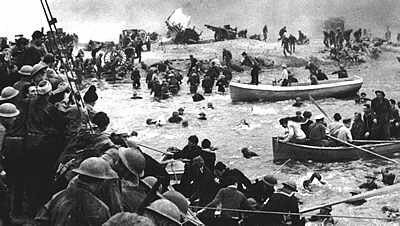 Hitler deliberately allows the British Army to escape at Dunkirk . "He (Hitler) then astonished us by speaking with admiration of the British Empire, of the necessity for its existence, and of the civilization that Britain had brought into the world. ....He compared the British Empire with the Catholic Church ­ saying they were both essential elements of stability in the world. He said that all he wanted from Britain was that she should acknowledge Germany's position on the Continent. The return of Germany's colonies would be desirable but not essential, and he would even offer to support Britain with troops if she should be involved in difficulties anywhere." The Allied army could have easily been captured. General Blumentritt reveals Hitler's admiration for the British and his desire to end the war. The Germans contact the British ambassador in Sweden, Victor Mallet, through Sweden´s Supreme Court Judge Ekeberg, who is known to Hitler´s legal advisor, Ludwig Weissauer. "Hitler, according to his emissary [Weissauer], sincerely wishes friendship with England. He wishes peace to be restored, but the ground must be prepared for it: only after careful preparation may official negotiations begin. Until then the condition must be considered that discussions be unofficial and secret. 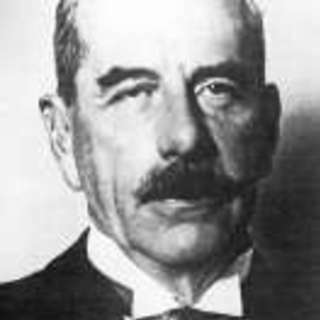 Hitler´s basic ideas [are that] today´s economic problems are different from those of the past [...] In order to achieve economic progress one must calculate on the basis of big territories and consider them an economic unit. Napoleon tried, but in his days it wasnt possible because France wasnt in the center of Europe and communications were too hard. Now Germany is in the center of Europe and has the necessary means to provide communication and transportation services. England and America now have the best fleets and will naturally continue to, because they will need the oceans for their supply. Germany has the continent. In what concerns Russia (USSR), Weissauer has given the impression that it should be seen as a potential enemy. " Ekeberg understands that this implies that the states occupied by Germany would de-occupied. Germany´s occupation was only due to the present war situation. Churchill is not interested in making peace. On May 25, 1940, Giuseppe Bastianini, the Italian ambassador in London, requests a meeting with British Foreign Secretary Lord Halifax to discuss Italy's neutrality. Halifax meets Bastianini later that afternoon. 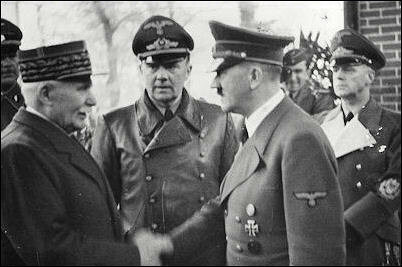 The discussion soon moves to that of Italian mediation between the Allies and Germany. Bastiani reveals that the goal of Italian leader Benito Mussolini (Hitler's close ally) is to negotiate a settlement "that would not merely be an armistice, but would protect European peace for the century." Halifax responds favorably to the idea and takes it to the British War Cabinet. The following morning Halifax gives his report, telling the Cabinet that in his opinion they "had to face the fact that it was not so much now a question of imposing a complete defeat upon Germany but of safeguarding the independence of our own Empire". Halifax summarizes his meeting with Bastianini and urges his colleagues to consider Italian mediation. Again, Churchill would have none of it! 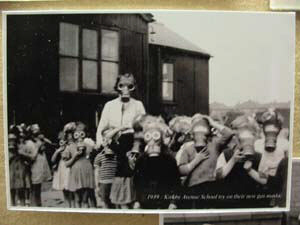 Instead of accepting any peace offers, Churchill's gang chose to frighten the British public with tales of imminent posion gas attacks from Hitler. For several days, Halifax continues to press for the Mussolini mediation. In an apparent attempt to placate Halifax, Churchill finally says that he "doubts whether anything would come of an approach to Italy, but that the matter was one which the War Cabinet would have to consider." But Churchill is lying to Halifax. Never did Churchill even consider Mussolini's offer to mediate peace between Britain and Germany. The matter eventually dies. The conflict between Churchill and Halifax became known as 'The War Cabinet Crisis'. 1. 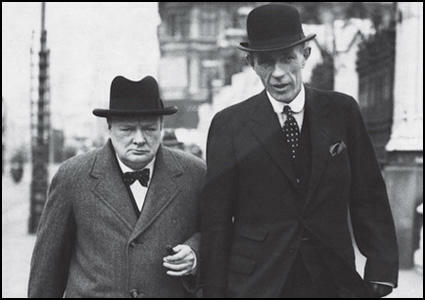 Halifax (r) tried very hard to convince the warmonger Churchill (l) to at least hear Mussolini's mediation proposal. 2. 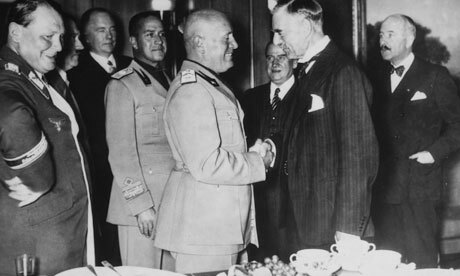 Mussolini, shaking hands with UK Prime Minister Neville Chamberlain in 1938, had helped Britain and Germany to keep the peace of Europe at the Munich Conference of 1938. That's when Churchill wrongly condemned Chamberlain as an "appeaser" - a slanderous label that has clung to Chamberlain ever since..
Hitler drops "peace leaflets" over London! With Germany now in total control of the continent and riding high in "the driver's seat". Hitler continues his campaign for peace by bypassing the British press and air-dropping leaflets explaining the causes of the senseless war, and ending with "an appeal to "reason". 1- British 'Black propagandist' Sefton Delmer keeps the war-fires burning by mocking Hitler's peace leaflets. 2- Ignorant British soldier shown laughing as he reads Hitler's leaflets. 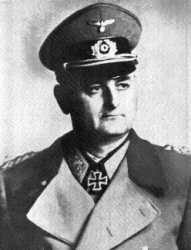 "The nature of the concessions that the German Fuhrer was prepared to make in order to obtain peace with Britain must have astounded the men at the head of SO1. This was not even a deal worked out through a process of hard negotiation. It was Hitler's opening gambit....an offer so generous and pragmatic that it would be very tempting to anyone who genuinely wanted peace. His (Hitler's) offer of such remarkable concessions was an extremely threatening development. Should the terms become public, it had the potential to render British resolve to stand firm against German aggression to a shuttering halt." 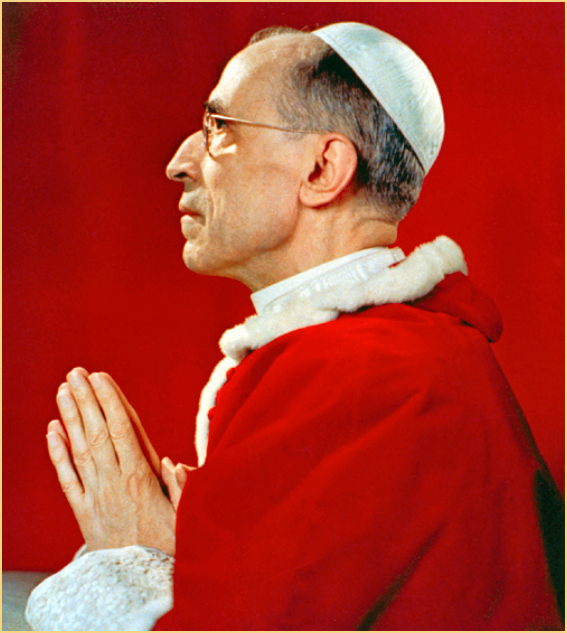 Neither the Pope's prayers nor his emissaries could sway Churchill's gang away from their warpath. Deputy Fuhrer Rudolf Hess is Hitler's "Right Hand Man" and long time friend. He is Germany's 2nd in command, or perhaps 3rd (behind Air Marshall Goring). In May of 1941, at a time when Germany is winning the war, Hess (who is fluent in English) flies a solo mission over Scotland and parachutes in with an offer of peace. Hess is attempting to link up with what he believes to be British peace activists. 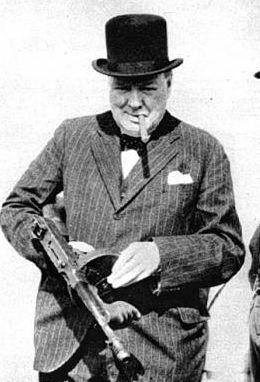 Instead, he falls into Churchills hands; to be held in solitary confinement for the duration of the war. After the war, Hess is sentenced to life in East Berlin's Spandau Prison. 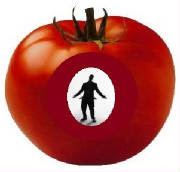 With the liberalization of the USSR in the late 1980’s, there is talk of finally releasing him. But he is said to have committed "suicide" in his cell in 1987. Many believes that the 93-year-old Hess was murdered so that details of his peace mission would remain buried forever. One couldn't be any closer to Hitler than Rudolf Hess. Right: Old man Hess was imprisoned for nearly half a century. The public was to remain ignorant of his peace mission. Hitler maintains a standing generous peace offer on the table. Churchill, by his own admission, refuses to accept! At all times, the Hitler-Hess offer of total cessation of the war in the West remains on the table. Germany offers to evacuate all of France except Alsace and Lorraine, which would remain German. It would evacuate Holland and Belgium. It would evacuate Norway and Denmark. 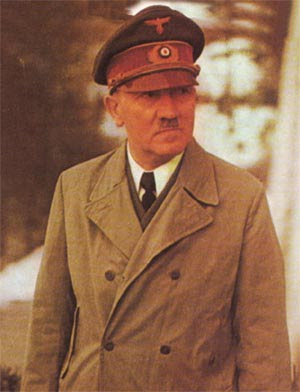 In short, Hitler wants to withdraw from Western Europe, except for the two French provinces and Luxembourg (Luxembourg was never a French province, but an independent state of ethnically German origin), in return for which Great Britain would agree to an attitude of benevolent neutrality towards Germany. 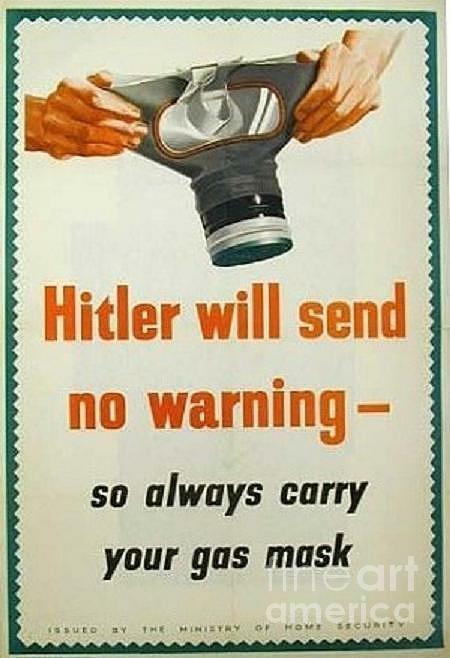 In addition, Hitler is ready to withdraw from Yugoslavia and Greece. 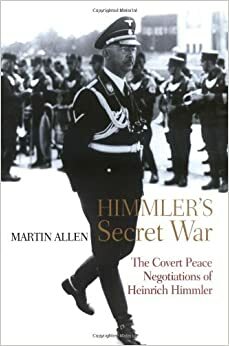 German troops would evacuate from the Mediterranean and Hitler would use his influence to arrange a settlement of the Mediterranean conflict between Britain and Italy. No country would be entitled to demand reparations from any other. 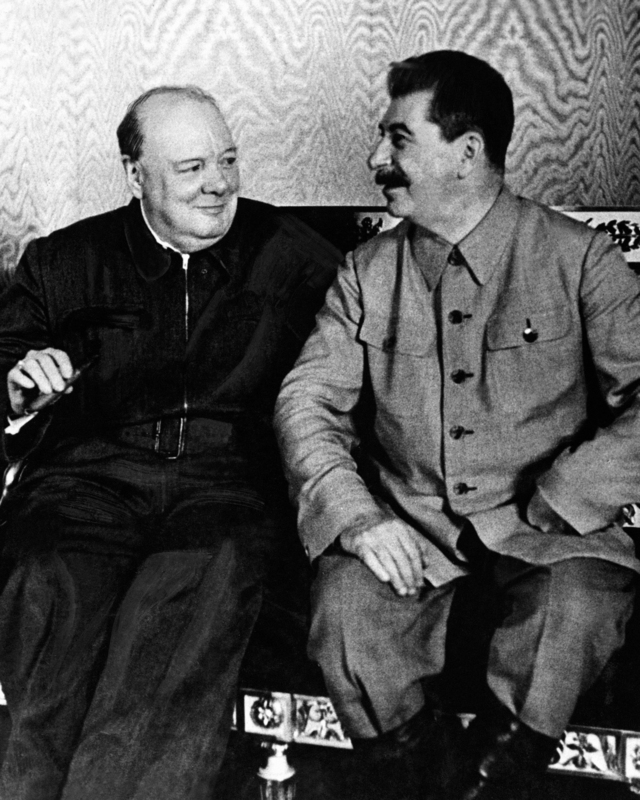 Churchill and FDR were very chummy with the great mass murderer Joseph Stalin; who worried that German peace offers might be accepted by his Western Allies. "More than thirty years have passed since 1914 when I made my modest contribution as a volunteer in the First World War, which was forced upon the Reich. It is untrue that I or anyone else in Germany wanted war in 1939. It was wanted and provoked solely by international statesmen either of Jewish origin or working for Jewish interests. I have made too many offers for the limitation and control of armaments, which posterity will not be cowardly enough always to disregard, for responsibility for the outbreak of this war to be placed on me. Nor have I ever wished that, after the appalling First World War, there would ever be a second against either England or America. Only three days before the outbreak of the German-Polish war I proposed a solution of the German-Polish problem to the British Ambassador in Berlin - international control as in the case of the Saar. This offer, too, cannot be lied away. It was only rejected because the ruling clique in England wanted war, partly for commercial reasons and partly because it was influenced by the propaganda put out by international Jewry. The bloody war which either killed, maimed or traumatized scores of millions of innocent people did not have to happen. What a shame. What a damn shame!